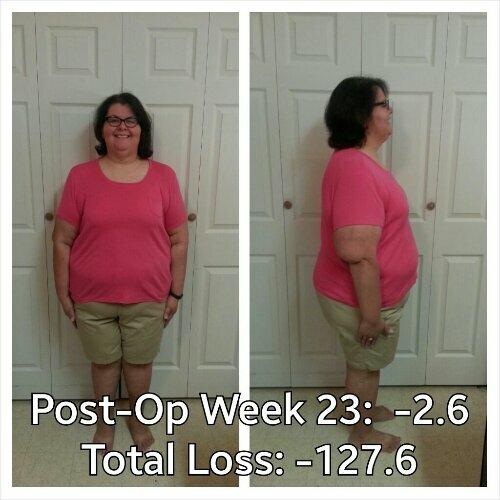 Post-Op Week 23 Progress Report and Less Than 100 To Goal! Good loss this week. I think my losses are slowing down to a healthy 2-3 pounds a week as I approach the 6-months post-op mark. I don’t care how long it takes me to get to my goal, just so long as I get there. Today marks another milestone: I now have less than 100 pounds to lose to get to my weight loss goal. I am less than 50 pounds from my surgeon’s goal. It is weird to think that I could possibly be at MY goal by the summer. And to be completely real with you, dear reader, I. Am. Terrified. Losing this next 99.4 pounds means that maintenance is after that. I know how to lose weight–this is a well-established fact that has been tested multiple times in the past 27 years (my first attempt at weight loss came at the age of 13, when I was forced to go to Weight Watchers by my parents). My medical records even demonstrate that I know how to lose weight. The problem is, I don’t know how to keep it off. Successfully. And maintenance is one of those things that the nebulous “they” never tell you about. They certainly don’t tell you about it when you sign on for this WLS gig. Perhaps because by the time you’re in the surgeon’s office asking him/her to cut out the bulk of a major organ or reroute an entire organ system so that it functions differently in an attempt to help you lose weight, you’re so far removed from the vaunted maintenance part of this journey, there’s no point in discussing it with you. Not yet. You’re not ready for “the talk.” You’re still trying to wrap your head around the fact that you’ve asked a doctor to cut you open to help you lose weight and you likely feel like you have failed yourself in some way, when really you haven’t. If you’re me, your biology and genes have failed you. Maintenance of the eventual weight loss you will enjoy (as long as you adhere to your doctor’s program) is something not to be discussed first–it’s like telling a kid that he will get to play in the NFL before giving him a football and teaching him to throw it for the first time. But when will maintenance start? And how will it look? 99.4 pounds isn’t many to me, when you consider how much I’ve lost, especially from my highest weight ever. I’m not sure what maintenance will look like, or how it will go, but I know one thing is certain: it is forever once I exit this precious weight loss stage of my life. This current stage is temporary, and I do it really well. At least I think I’ve done it pretty well so far. Maintenance, though…in my mind, I’m still so far away from it, but in actuality, I’m not. I’m about to hit my 6-month post-op mark here in three weeks. I’ve lost over half of what I need to lose to get to my goal, and I’ve lost 73% of what I need to get to my surgeon’s goal. Maintenance is coming sooner than later and I’ve got to start thinking about what that is going to look like for me, especially since I will likely hit maintenance while my husband is still in weight loss mode. I’ve already achieved a bunch of the goals I’ve set for myself along this journey, so now it’s time to make some new ones and start knocking those down too. I’ve set another small weight loss goal to aim for, so here’s to hoping I hit it by the time my deadline rolls around. I think it’s a doable thing to lose another 20 pounds by Valentine’s Day given that my weight loss appears to be slowing down (as my doctors have all said it would around this time). I just hope it doesn’t slow down to a crawl. There are days when I think my body is going to finally wake up and go, “WTF did you do to us?? ?” and my weight loss is going to stop altogether. Also, as of today I have lost a total of 77 inches from around my body. A bit of perspective: that’s a 6’5″ tall person that weighs nearly 130 pounds. OFF MY BODY. Mind. Blown. This week’s challenges: holiday parties and the end of the semester…already have plans in place for both, so let’s hope that the plan works and I avoid a stall in my weight loss or worse, a gain. Lunches are packed out, breakfast fixins are packed out, most dinners are planned, and I’ve chosen sleeve-friendly snacks to take for the parties I have to attend this week. I’m planning on squeezing in some treadmill time since I have half days this week at school (meaning I get to leave right at 4 instead of 5:30) and I’m golden with my water drinking. I can do this. BRING IT, LIFE. This entry was posted in challenges, expectations, goals, head trips, la guerra, maintenance, meal planning, oh behave!, planning, post-op, progreso, reflections, success, the sleeve, vsg, weight loss surgery and tagged fear, goal setting, goals, head trip, maintenance, meal planning, planning for success, post-op life, progreso, progress report, self-image, social eating, the struggle is real, VSG, vsg realness, WLS, work that head game. Bookmark the permalink.